La mission V 191 est programmé pour l'instant au 23 septembre 2009. Merci pour l'info, date modifiée. Lancement le 30 septembre. H0 à 22H00 TU. Les deux satellites, Amazonas et COMSATBw 1 sont maintenant intégrés au lanceur. Le lancement est toujours programmé le 30 septembre à 22h00 GMT soit minuit pour Paris. The fifth Ariane 5 for launch in 2009 is ready for liftoff next week following the integration of its military and civilian telecommunications spacecraft payloads at the Spaceport in French Guiana. With the Amazonas 2 and COMSATBw-1 satellites installed atop the Arianespace heavy-lift vehicle, this Ariane 5 is now undergoing a last series of checks in preparation for its rollout to the Spaceport’s ELA-3 launch zone. The Ariane 5 is inside the Final Assembly Building, where Amazonas 2 and COMSATBw-1 were integrated earlier this week. Upcoming milestones will be the pre-launch readiness review on Monday, September 28, followed by the vehicle’s transfer to the ELA-3 launch pad on Tuesday. Liftoff of the Ariane 5 is planned on September 30 during a 1 hr. 10 min. launch window that opens at 7:00 p.m. (local time in French Guiana). 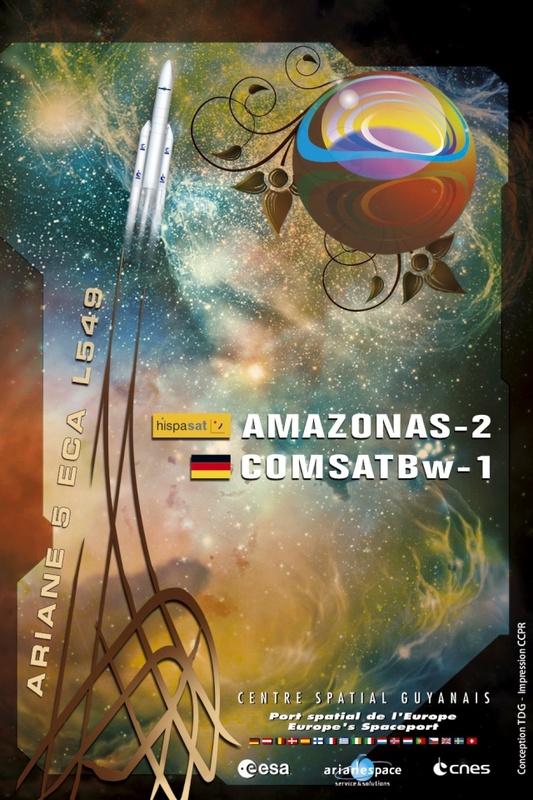 Amazonas 2 will ride as the upper payload, with COMSATBw-1 positioned as the lower satellite passenger in the Ariane 5’s “stack.” The two spacecraft will be deployed during a mission lasting 33 minutes. The 5,500-kg. Amazonas 2 is based on EADS Astrium’s Eurostar E3000 spacecraft bus, and will be operated by Spain’s HISPASAT from a final orbital slot of 61 deg. West. This satellite will provide relay capacity over the Americas, with a coverage area extending from Alaska to Tierra del Fuego. COMSATBw-1 has a liftoff mass of approximately 2,500 kg. and will play an important role in the German Bundeswehr’s (German Armed Forces) concept for network-centric operations. It is to serve as the backbone of a strategic command infrastructure and interface for the Bundeswehr’s tactical arms, handling secure information – including voice, fax, data, video and multimedia applications – for use by units on deployed missions. The COMSATBw-1 spacecraft’s coverage area will extend from America to eastern Asia. For this German military program, Astrium is responsible for the space segment and is Arianespace’s customer for the commercial launch services. Thales Alenia Space designed, manufactured, integrated, tested and delivered the satellite to Astrium, while Astrium’s German subsidiary TESAT manufactured essential parts of the payload. C'est bien triste de ne plus pouvoir vous donner de news "temps réel"
Apparemment reporté au 1 octobre..
Arianespace’s fifth flight of 2009 has been rescheduled to the evening of October 1, allowing complementary checks to be performed on the heavy-lift Ariane 5 launcher. The Ariane 5 currently is positioned in the Spaceport’s Final Assembly Building, where the vehicle and its dual-passenger payload of the Amazonas 2 and COMSATBw-1 telecommunications satellites are in a safe mode. rollout to the launch zone on the following day. Liftoff is planned on October 1 at the start of a 1 hr. 11 min. launch window that opens at 6:59 p.m. local time in French Guiana. selon le message plus haut Ariane s'envolera a 01:11 le premier octobre??? c'est a dire tout a l'heure? 19:59 Guyane le 01/10/09 > 01:59 demain dans la nuit du 1er au 2/10 pour nous!! Va falloir revoir ton anglais Pierrot ! Est-ce que l'on doit se baser sur ces infos ? Voilà ma technique pour voir si une réponse est arrivée. je retourne à la page précédente et je reviens sur la dernière page. je dois mal m'y prendre ? Tu peux tout simplement cliquer sur le bouton "rafraîchir" de ton navigateur ça recharge la page en l'actualisant. PS: bonne nuit a tous! je part destination DODO!